Good morning from Kennedy Space Center in Florida! The sun has risen on launch day for the SpaceX-3 mission which remains on schedule for liftoff at 4:58 p.m. EDT from Cape Canaveral Air Force Station adjacent to Kennedy. 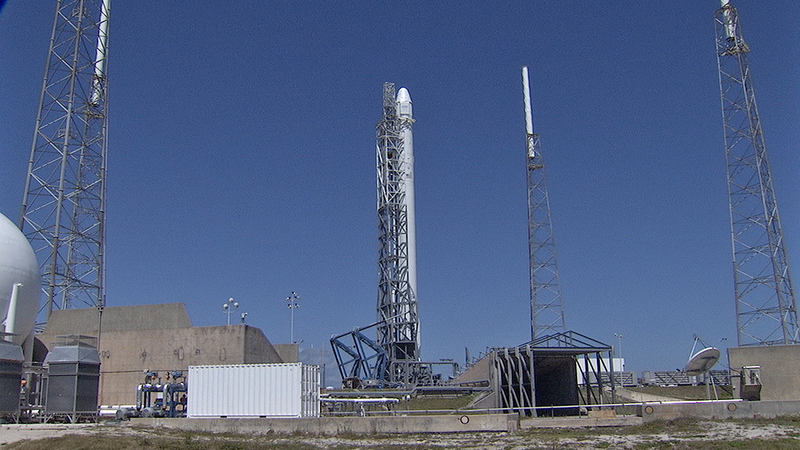 The weather forecast calls for an 80 percent chance of acceptable conditions this afternoon at launch time. Meteorologists will be on the lookout for thick clouds that could develop as the day progresses. The Falcon 9 rocket and Dragon spacecraft were lifted into launch position yesterday, as seen in this picture from NASA TV. 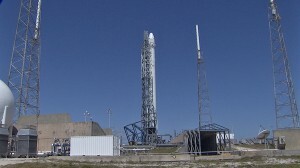 We’ll begin our continuous countdown coverage on the NASA Launch Blog at 3:45 p.m. NASA TV coverage begins at the same time here.